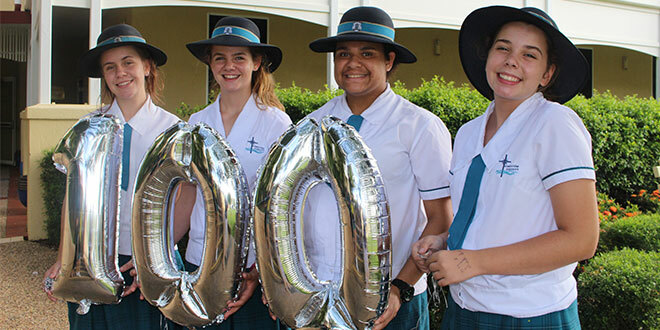 Celebrations: Tahlia Brennan, Renee McKeering, Denikah Elisala and Taylor Allen, of St Ursula’s College, Yeppoon, joining in centenary celebrations. ST Ursula’s College, Yeppoon, has launched into a year of celebrations for its centenary. Principal Catherine Dunbar said special college-based activities on March 12 were a prelude to even bigger festivities during Centenary Celebrations Weekend on May 4-6. “On Monday, March 12, all current students gathered for a special liturgy and then had a ‘100 years’ photo taken by college alumna Rebecca O’Grady, before enjoying a piece of college ‘birthday’ cake,” Mrs Dunbar said. Mrs Dunbar said The Courier-Mail columnist and past student Kathleen Noonan would launch the centenary book, 100 Stories, compiled by Barb Tamassy, at a civic reception on the night of May 4. “Our College Open Day on Saturday, May 5, is very much a community event, and we hope to see many past, present and future students, and their families, at the campus to share this milestone with us,” Mrs Dunbar said. “We also encourage any adults from our extensive network of past students and parents, to support the college and attend our gala evening, Centenary Under the Stars, on Saturday, May 5. “For those who enjoy a quieter social scene, Memories Dinner at Yeppoon Town Hall will involve a sit-down dinner, roving microphone, and entertainment by local ensemble Motherlove, and this will also be held on Saturday, May 5. “Bishop Michael McCarthy will preside over a Mass of Thanksgiving on Sunday, May 6, and a 100 Voices Choir will debut our newly composed college song after a performance of One Step Beyond, an original musical production. Past students are encouraged to register their interest by phoning the college reception on (07) 4939 9600, visiting http://stursulas.qld.edu.au/about-st-ursulas/past-students/ online, or following St Ursula’s College Yeppoon Alumna on Facebook.